Now that much of the fuss and flurry of releasing a new book has passed, the two questions I seem to be asked most often are ‘Have you started work on book four yet?’ and ‘What’s your next project?’ The answers are yes, and well, I’m working on a few things or rather, there are a few things bubbling on the cauldron in my subconscious, where my stories have to brew before letting me know of what they are concocted. I only have a ream of notes for Book Four and some half-written snippets. But the main storylines are laid out in my head and I have a good idea of what this book will look like in some areas. I’ve also been busy re-working and re-editing both Exit Unicorns and Mermaid in a Bowl of Tears. The new editions will be out within the next few weeks for Exit Unicorns, and the next couple of months for Mermaid. Next in line is getting all the books ready for the Kobo and Nook platforms, as I’ve had many requests from readers who would like to see the books available for their particular e-readers. The projects brewing in that aforementioned cauldron are a book about the Irish Potato Famine and a story about Jamie Kirkpatrick’s illustrious ancestor, one ‘Silken James’. All I know about him so far is that he’s a wee bit impoverished, he’s a mercenary, he’s bloody gorgeous and Queen Elizabeth I is really rather taken by him. 🙂 He’s only just started ‘talking’ to me, so I’m just getting glimpses here and there. What I see thus far is fascinating though, and I look forward to following him on his adventures. The Famine book is one I’ve had in the back of my mind for many years. I wrote a short story on this topic and it won a few prizes. The writing of that story was a strange experience. I wrote it all in a weekend and then immediately gave it to my husband to read. He was rather quiet when he finished it and when I asked why, he said he had the oddest feeling that she had somehow come through me to tell her story and I hadn’t made it up in the least. Well, that chilled me because I had the same feeling, but had chalked it up to my rather fey viewpoint. Here is the beginning of that short story, which has now grown to almost one hundred pages. My name is Bridget Moran, but all who knew me, simply referred to me as ‘Bridget of the Fairies’- claiming they’d known from the first I was not of this world, nor kin to the human race. People say as they like in hindsight, but I imagine I seemed no more unusual than any of the other babbies born that year. A mite small, perhaps, with the strawberry hair only true witches are said to have and with eyes that my mam claimed looked straight through a soul from the first. I only knew I was different from the other children and that I saw too well their games, their small deceits, their narrowness of experience and thought. And they knew me for different too, which is where all the trouble started. Later they would come to me with their troubles, wanting help, wanting cures, not ever realizing that what ailed them most lay within their own hearts, a canker that could not be reached by the most potent of magic, nor the potions of plants. But still, despite their need of me in the most desperate of times, they did not like me, but they feared me, which kept me safe for the most part. My village was the whole breadth of my experience. Fifteen square miles of soil and wee cottages. The townland, the baile of my youth became the expanse of all my years. You will think I was an ignorant peasant who knew not how to want more. You will smile at my simplicity, spare me a moment’s sorrow and forget. But I tell you—the measure of my dreams was the span of a world entire. I’d like to tell you my story, but first you must understand my landscape. Will you come? Will you look through history’s kaleidoscope, knowing that the passage of time distorts vision and makes the dead seem small, even toy-like, as though we existed in dioramas, the sort found in folk museums. That, in a nutshell, is what I’ve been up to. All my books are available on Kindle and in trade paperback format- thankfully the new editions will be priced lower than the current ones. 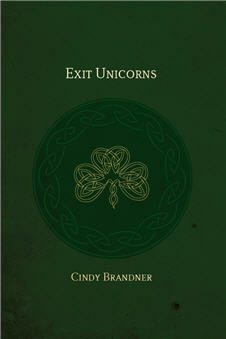 Below is an image of the new cover for Exit Unicorns.